The anti-Donald Trump is coming to town. And he speaks Spanish, too. That is how Toosi introduces an article about the upcoming visit to the United States by Pope Francis. And it is the perfect way to capture the zeitgeist of the moment, isn’t it? When Pope Francis addresses Congress later this month, U.S. Catholic leaders expect the popular, groundbreaking pontiff to call on Americans to set aside their political divisions and unite to tackle challenges such as climate change, economic inequality and immigration reform. It will be very interesting to watch how the Republican candidates respond – especially the three that are Catholics. But beyond that, it changes the conversation. Over the summer the media ledes have all been about what gawd-awful thing Trump said, or what gawd-awful thing one of the other candidates said to try to get noticed, or a discussion about how much the so-called “email controversy” has hurt Hillary Clinton. Due to the fact that our current media routine is to go “all-in” on whatever is the sensational story of the day, I expect that we’ll be hearing 24/7 about what the Pope has to say about things like climate change, economic inequality and immigration reform. As we know from the past, he says some pretty interesting things. 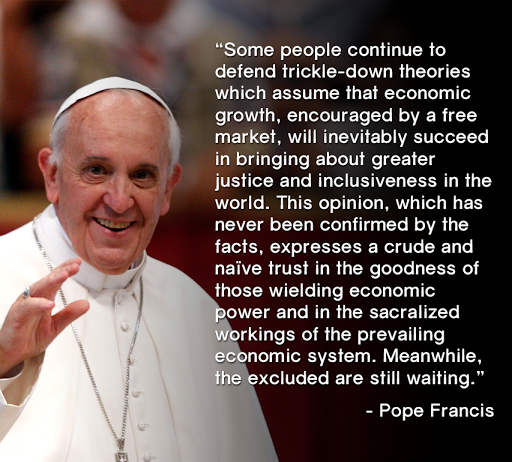 Look how far down he was willing to drill on the politics of “trickle-down economics” as a cause of income inequality. On a more spiritual (not religious) level, Pope Francis is also likely to inject an element of calm compassion into these discussions as an antidote to the fear-mongering and anger we’ve been witness to lately. That will surely be a welcome relief. I am particularly interested in the impact this Pope might have on Catholics who were part of the so-called “Reagan Democrats” that left the Party when Republicans zeroed in on abortion as a wedge issue. While this Pope will certainly maintain the Church’s commitment to being pro-life, what he has done is remind Catholics that there are other tenets of their faith that do not align well with the current iteration of the Republican Party. And if Latino Catholics had not already been scared off by the conversation currently underway about immigrants with the Republican candidates, this Pope from Latin America is likely to help them seal the deal. So yes, I’m politicizing the Pope. Perhaps I feel more comfortable doing that as a non-Catholic. But I think his visit is going to be a game-changer. Given that, I’ll not be surprised when/if more articles like this one turn up containing rumors about a conservative revolt in the Vatican. That’s because game-changers always spark a backlash.